Several orphanages in Ukraine had two unlikely visitors over the holidays. Under the direction of the local charity His Kids, Too!, Tallahasseeans Rich Fillmon and his daughter, Lydia, a Lincoln High School senior, flew to Ukraine on Christmas Day for a two-week stay in the eastern Ukrainian city of Dzerzhinsk. Hundreds of Christmas boxes from six states, valued at more than $8,000, were waiting to be distributed when they arrived. Hundreds of Ukrainian orphans received these goodie-filled boxes, their only Christmas gifts. In September, His Kids, Too! will be collecting boxes to send to orphans in Ukraine for Christmas. Contact the organization for more information at 524-5437 or view the Web site at www. hiskidstoo.org. Special thanks to the wonderful outpouring of love and donations from Raa Middle School. Geography teacher Jane Walker spearheaded the 5th clothing drive. Below is the article from the Tallahassee Democrat . Several Leon County schools have been helping work holiday miracles in recent weeks. Leon High was among many schools that collected tons of food for needy families at Thanksgiving. The Raa Middle School Junior Beta Club gathered and distributed Christmas gifts for children in that community. "I am so very proud of Raa's Junior Beta Club," club sponsor Lynne Harris said. "The students are so kind-hearted to share with others during this special time of year." In October, Raa teacher Jane Walker's sixth-grade geography classes participated in a service project to benefit orphans in Ukraine. "The students were very touched by the plight of these orphans when Mrs. Teresa Fillmon, the director of a nonprofit organization called 'His Kids, Too! ', spoke to them," Walker said. "The students opened up their hearts and purses and collected about 575 pounds of clothing, personal-care items and toys to be sent to the Ukraine. They also donated $645 for His Kids, Too!" The teenagers in Swift Creek Middle School's Student Government Association adopted three families through the "Creek Holiday Connection, said Debbie Gibson, intensive math teacher. They provided the families with warm jackets and clothes, food, household needs and gifts. "This is the second year the (Swift Creek) Wolves have adopted families for the holidays," Gibson said, "and it looks as if it will become an annual project." His Kids, Too! receives Grant! more children for Christ. Below is the report from the Tallahassee Democrat . His Kids, Too!, a Tallahassee-based nonprofit organization that helps thousands of orphans in Ukraine, has received a $20,000 grant from the Independent Presbyterian Church of Birmingham, Ala. This is the second year the charity has been a recipient of an award from the Independent Presbyterian Church, according to Teresa Fillmon, executive director of the charity. This year, the grant has been designated for salary support for the director and for providing humanitarian aid in Ukraine in 2007. For more information about His Kids, Too!, visit www.hiskidstoo.org or call (850) 524-5437. His Kids, Too! was recently featured in Charisma Magazine, November 2006. 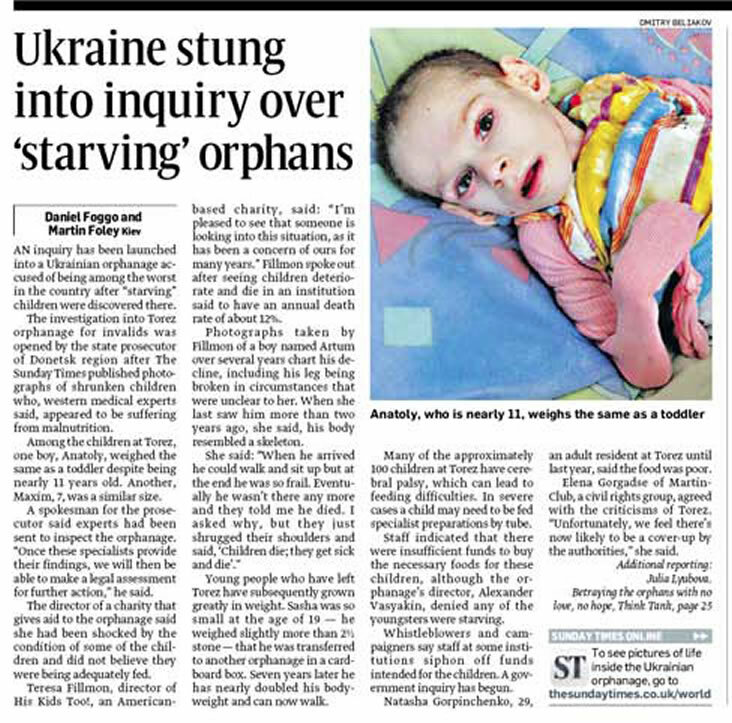 Volunteer Domini Hedderman of PA wrote the wonderful article after interviewing Teresa Fillmon about orphans in Ukraine. His Kids, Too! would like to thank Charisma Magazine for their committment to providing an outlet to the world to read about the plight of orphans in Ukraine. Rich and Teresa Fillmon became acquainted with Ukraine and its people through the Meridian Woods Church of Christ, where they are members. They came to know a people who need much and ask for nothing after missionary trips to the area; they soon realized that, as Teresa Fillmon says, “the key is to get those kids out of there.” A family of deep faith, the Fillmons acknowledged the Scriptural admonition in James 1:27 to “look after orphans and widows” as further motivating them to adopt a Ukrainian child. Fellow church members Faye Howell and Michael Webb and Howell’s daughter, Lauren, joined the Fillmons in their Ukrainian odyssey. To adopt 4-year-old Artur, the Fillmons and their friends surmounted bureaucratic snafus, state holidays, a language barrier and several 22-hour train rides. As annoying as all that was, it was just the beginning. The previous October, Teresa had traveled to Ukraine with a shipment of humanitarian aid – medicine, toiletries and other simple necessities that we often take for granted. “What about adopting a Ukrainian child?” Rich had asked her before the trip. He urged her to “look around, be open” to the possibilities. All Ukrainian adoptions start at the Adoption Center in Kiev, the capital, Teresa relates. The normal procedure is to inform officials the age range of the children you’re interested in and to let them know if you prefer to adopt from a specific region of the country. Then you see pictures of children from that area who might meet your criteria; you’re invited to visit the children and make your selection. “Although you are not allowed to pre-select a child for adoption,” Teresa says, “I felt that (in October) the Lord had led me to a boy in Dzerzhinsk named Anatoly. Our church supports the orphanage there, and I had every intention of going over and picking up Anatoly.” To begin with, the Fillmons traveled to Ukraine and their friends, the Howell-Webb family, journeyed as far as Prague, in the Czech Republic, where they waited to learn how they might help out. Although the Fillmons had no way of knowing it, the Ukrainian bureaucracy would quickly quash Teresa’s original plan to adopt Anatoly. Because someone at the orphanage in Dzerzhinsk had placed a child with no regard to the official guidelines, the government downgraded it to a foster home. Children from Dzerzhinsk were no longer eligible for adoption. Not to be deterred, the Fillmons decided to travel to Dzerzhinsk first to drop off seven 70-pound bags of humanitarian aid they were carrying. The trip had a second purpose as well, they say. “Someone told us that since there had been a bad adoption out of that orphanage, we should talk to the mayor.” Perhaps he would be willing to help them circumvent normal channels and adopt the child Teresa had met earlier. The plan was a miserable failure. For Teresa, it was back to Kiev and the Adoption Center following a passionately negative response to their proposal. “We knew from the beginning that this (the adoption) was God’s will,” Rich Fillmon says. “We also knew that these obstacles were put in our way just to distract us.” Reassurance also came from another front. When Teresa called Howell in Prague and mentioned that the adoption might have to wait until a later trip, Howell urged her to go somewhere else. “There’s got to be a boy for you somewhere,” she urged her friend. Another traveling companion, Lyuba Yenatska, a Russian translator from Gainesville, pushed the Fillmons to at least try other cities. Back in Kiev, following her first shower in six days, Teresa Fillmon visited the Adoption Center again, trying to determine her options and make some decisions. Tamara Kunko, the center’s administrator, was adamant that the orphanage at Dzerzhinsk was no longer an option. “It was the Ukrainian equivalent of ‘What part of no don’t you understand?’” Teresa recalls. Mrs. Kunko offered pictures of several 3- and 4-year-old boys, children of the Fillmons’ target age and gender. The orphanage in Mariupol had six boys who qualified, Teresa says; she felt as if that would give them a greater chance to find the child they were seeking. It was back to the station for another train ride, this one 22 hours long. Rich and the children remained in Dzerzhinsk after deciding it would be easier if only one person made the return trip. Because she wanted to observe them in as natural an environment as possible, Teresa asked the boys’ teacher to simply lay her hands on those children who were eligible for adoption. One by one, she pointed out the children from whom Teresa could choose. Some did not look well, and others seemed to have difficulty relating to their peers. Soon Artur, a small boy with gleaming eyes and a captivating smile, entered the room. His self-confidence and personality were readily apparent. When the teacher indicated that he could be adopted, Teresa quickly chose him as her son. With Artur’s paperwork in hand, Teresa made it to the train station just in time to send the papers on the 22-hour journey back to Kiev. They arrived on a Friday afternoon, too late to be processed. Then Rich and the children took the 2 a.m. train to Mariupol to join Teresa. They met their new son and brother for the first time when Teresa arranged for Artur to spend the night with them in a hotel. The whirlwind of paperwork and legal approvals intensified. Next, the Fillmons needed a court date before a Ukrainian judge so that the adoption could be approved. March 8 was their target, but that was Women’s Day, a national holiday in Ukraine. (Because many men work hazardous jobs and die young, the role of women assumes great significance in Ukraine. Women fill many essential government positions.) They finally were scheduled to meet the judge March 9 to finalize Artur’s adoption. Giving a gift isn’t all that unusual in Ukraine, but it does take a little finesse, Rich says. While public officials may appreciate a little extra money now and then, they are highly insulted if you just offer it to them up front. With a little help from their translator, Lyuba, the Fillmons compensated the judge and got a 4 p.m. appointment the following day. When Artur’s adoption was finally approved at 5:30, they knew they were coming down the home stretch. Thanks to the delays as the trip began, it was time for Rich, Dallas, Lydia and Haley Fillmon to return home. Rich was expected back at work as security director for the J.C. Penney store in Governor’s Square, and the children had exhausted their leaves of absence from Gilchrist Elementary and Raa Middle School. “Before we left, Teresa was sorting through a suitcase of clothes we had brought with us for the child we’d adopt,” Rich says. “All of a sudden I heard her gasp – she said something like, ‘Oh, my goodness!’” While sorting out the clothing she would keep for Artur, Teresa had found a T-shirt decorated with Arthur, the bespectacled aardvark familiar to so many American children through television. Ironically, the Fillmons say, Artur is Russian for Arthur. Teresa, by now on her own, stayed in Mariupol to finish the legal work. (“I got his passport at 4:45 and had to be on the train back to Kiev at 5:55.”) When she went to pick up her son for the trip home, she worried how well he would make the transition. Would he miss his schoolmates? Would he cry after being separated from his caregivers? “When Teresa arrived at the orphanage to pick him up,” Rich says, “she was worried that he might cry or want to stay with his classmates. Instead, she told me, he put his hand firmly in hers and never even looked back.” He remained cheerful even during the long train ride back to Kiev and the ensuing trip through Poland (where Teresa had to pick up Artur’s visa) and on to Atlanta and Tallahassee. The Fillmons returned in December of 2002, returning in January 2003 with their daughter Alla. How did you become involve in the Ukraine ministry and what prompted you to start His Kids Too!? My background is Psychology and Social Work. My occupation was in helping people. When the opportunity arose to help people with a clothing ministry through Rich’s job at J.C. Penney, we started helping here in the community. That was in 1986. We still continue this ministry, under the name of Captital City Clothing Connection. When I met some missionaries from Albania, they asked for assistance and I could not refuse them. Then, other local people who support missionaries in many places started asking for help. We began this ministry in boxes and now we have distributed a material inventory of over $400,000 and have served over 50,000 people in 18 years. Who knows the domino effect. We do not receive any government funding and rely solely on private donations for our funding. In 2000, people wanted to start providing funds so that I could make purchases in-country for the orphans and people. Some in-country purchases can be made and this helps generate the local economy. It is VERY important that ‘locals’ see that you believe their products are worthy of your ‘American dollars’, and not just ship everything to the country you are serving. We formed His Kids, Too! in 2000 so that people could receive a tax benefit for their donations. We presently serve people in: Ukraine, Albania, Russia, Nigeria, Kazakhstan. In the past we have also served in: Mexico, Cuba, China, Italy, and Bosnia. If the Lord opens a door, we will gladly go back to any country. Explain the goals of His Kids Too! The goal of His Kids, Too! is to bring the gospel of Jesus Christ to people while meeting their most basic needs. It is hard to talk to someone about God, or show them the love of God, if they are sick, unclothed and hungry. They just can’t ‘hear’ the message. Tell what types of facilities you support with humanitarian aid (i.e. orphanages, etc.) and in what cities. In Ukraine alone, His Kids, Too! supports, hospitals (both adult and children’s), children’s shelters, several orphanages, Internat (this is for children 5-17 yrs. of age), mental hospital, aids children’s hospital, orthopedic hospital, Cerebral Palsy Group in Kyiv, widow feeding program in Donetsk and Dzerzhinsk. In total we are working in 11 facilities with over 2500 children and hundreds of adults. In Albania, we support three orphanage facilities with over 300 children. Tell in general about the people who benefit from the aid and give an example of someone who you have assisted. The people who benefit are people just like you and I. They want to wear clean clothes, want food for their children and medical care, they want a future…….they are no different from us. It is our God given opportunity to serve them. We have placed special needs children in loving Christian homes whereas they would have been placed in a horrid institution. We have helped children without wheelchairs have mobility by providing a wheelchair. Children without clothing, coats, shoes, boots, personal care products, are all provided with these items…….because of donations. His Kids, Too! is just the messenger of your love for Christ. We can’t do this alone. Who else is involved in His Kids Too! and what do they do? Board Members, are: Lynn Allison, Donetsk, Ukraine; Ray Grayham, Donetsk, Ukraine; Nikka Donetsk, Ukraine. In-country aid distribution; Rich Fillmon, Tallahassee; Organization Communication Director, Teresa Fillmon/ Founder/Director. Additionally, we have over 20 active volunteers in several roles: donation collections, grant writing, sorting items, fundraising, letter writing, and more. Tell something about yourself – when & where baptized. Other businesses. Hobbies (if you have any spare time! ), how long married. Tell something about Dallas, Lydia and Haley including their work with the ministry. Dallas, Lydia and Haley are great kids. Dallas and Haley have a wonderful nurturing side to them, whereas Lydia is more outgoing and playful. They each play a vital and important role in the ministry. Each LOVES to go to Ukraine, and hold, play and interact with the children. Dallas is wonderful for carrying all the heavy boxes; Lydia and Haley for sorting and sizing up kids for clothes. Each have their special stories about individual kids that they have grown attached to. Tell about adopting Artur and Alla. Also Lena. Originally, we wanted to adopt from Albania, but it was closed to Americans adopting for quite sometime. Then I was invited to Ukraine, and we decided that this may be a good international adoption choice. We started the process, and then I traveled to Ukraine in October 1998. We completed our paperwork and travel in Feb. 1999 to adopt Anatolyi, but after arriving the officials said we could not adopt this child (giving no reason). It was extremely difficult not to just leave, but we knew that God had put us there to adopt a child, and He directed us towards Artur. Artur is doing well, but has abandonment issues, since his biological mother left him at 14 months. The transition has had its ups and downs and we appreciate the kindness and encouragement we have received from our church friends. We still think about Anatolyi and pray for him. As far as we know, he is still in Ukraine. After meeting Alla in 2000, we just prayed for this cute little girl. Each time I visited the orphanage I would specifically ask about her, and they would tell me, ‘no one wants her…just look at her….’ It was very sad, and time after time, I would see her, and she was VERY sad. I never saw her smile. During our summer trip of 2002, I was told she would be sent to an institution until at least 18 yrs. of age due to her disability and lack of adoptability. When Rich saw my grief over knowing that Alla would be institutionalized, he said, ‘let’s adopt her.’ We finally got to Alla on Christmas Eve 2002, and asked her if she wanted a ‘mom and dad, and a big family’ (It was important that she wanted to go with us, and that we just not make her). She smiled for the first time, and said, hesitantly, ‘yes, I want a family.’ I cried, as did many others in the room. The worst part of that day (Christmas Eve), was leaving her. She looked at us, and you could see that she didn’t think we were going to return, even after much assurance. Christmas Day, could not have been better, as we went to the orphanage, and waited for Alla. When she came into the room, she just ran into my arms, saying, ‘mama, mama, you came back.’. I said, ‘I told you I would, I love you!’. Haley took her and started to play with her, and that day, for the very first time, Alla laughed! It was a wonderful Christmas, even though we were 7000 miles from Lydia and Dallas (which was EXTREMELY hard for us). She left that orphanage on December 28th with many tears from the workers and director. Alla was smiling ear to ear, saying, ‘I’m going to America with my family!’. I met Lena in 1998 on my first trip to Ukraine. She and I had an instant ‘bond’ and with each visit we grew closer. When she was able she started translating for me, and that drew us closer. She was granted the visa, and has been living with us for 16 months going to school at TCC. She will start FSU in the fall, where she has received a partial scholarship in music. How can people assist in your ministry? I know you need volunteers. His Kids, Too! always need volunteers to assist with donation collection, fundraising efforts and networking supplies. New and used items are frequently needed, but funds are also needed for the ongoing programs that we have in Ukraine. Additionally, making in-country purchases is vital to their economy. All His Kids, Too! staff are volunteers. We pay for our own travel expenses and any other expenses of His Kids, Too!. All donations to His Kids, Too! are tax deductible and benefit widows, orphans and other needy people. We encourage people to review the website (www.Hiskidstoo.org) for detailed reports on how the funds are spent, and view the hundreds of photos of my frequent trips to Ukraine. His Kids, Too! is an avenue to take the word of God to the lost of this world, by meeting their individual needs while showing them the love of the Lord. Many times we think of people in far away lands and think they are unreachable………just a long way away. His Kids, Too! tries to bring a face to those people, and provide others with an opportunity to serve them, changing lives one at a time …….because remember even though you may not know them personally, and they don’t live around the corner, or in another state, but across the world, they are His kids….too! In 2004 it came to our attention that a young girl, Natasha was in dire need of medical attention due to Treacher Collins Syndrome. Treacher Collins Syndrome is a rare inherited disorder characterized by distinctive abnormalities of the head and facial (craniofacial) area due to underdevelopment (hypoplasia) of certain portions of the skull (e.g., supraorbital rims and zygomatic arches). Although the symptoms and physical characteristics associated with Treacher Collins Syndrome can vary greatly in severity from patient to patient, craniofacial abnormalities tend to involve the cheekbones, jaws, mouth, ears, and/or eyes. If Natasha did not receive medical assistance she would have eventually gone blind due to the lack of cheek bones to support the eye sockets. His Kids, Too! started investigating medical resources to assist with this problem, and Fresh Start Surgical Gifts in San Diego California gladly accepted her as a case. After a host family was secured with, George and Helen R. of San Diego, Natasha and her grandmother made the 8500 mile trek to California. Arriving in April of 2005, Natasha's treatment plan was started and she has progressed. The treatment will continue for at least the next 36 months. Fresh Start has been wonderful, and the host family totally accommodating to their needs. Even after arriving and 'grandma' having a terrible growth in her upper arm, the host family, though able to secure some medical treatment for this cancerous growth, the grandmother decided to return to Ukraine for treatment. She is presently in Ukraine. We would like to thank Fresh Start Surgical Gifts, the wonderful host family, Canyon View Church of Christ, and the donors who have specifically supported this medical need. Your funds went directly to help with airfare, and for their living expenses. We encourage anyone wanting to support this extension of the ministry to contact us directly.